When I started surfing the Great Lakes in 1998 the first thing I learned from the tribal elders I was sliding waves with on the South End of Lake Michigan was simple but crucial: “Get a nice wetsuit.” They knew that if you were serious about surfing here that you couldn’t skimp on the rubber. If you did, you’d have a miserable experience and wouldn’t last long. They were right, and they still are. Wetsuit technology has drastically changed since the first dive suits were tested by surfers as a way to stay warmer on the central coast of California in the 1960s. Even in the 20 years I’ve been at it, the changes have been very noticeable as wetsuit companies continue to find ways to make the neoprene warmer, lighter, and stretchier. It’s the holy grail of surfing wetsuits: to get the most warmth, stretch, and fast-drying suit to be as light as possible and to last as long as possible. They keep getting closer. Where are you surfing, and what time of the year are you surfing? If you only plan to go out on our far southern shores (Lakes Erie and Ontario, and the southern half of Lakes Michigan and Huron) in July and August you may only need a 3/2mm fullsuit, a shorty/spring suit (usually 2mm), or a wetsuit jacket/top. Or if you’re a real lightweight (and understand that you won’t get out to surf here much in only a swimsuit), no wetsuit at all. But if you surf anywhere on Lake Superior or want to surf in fall, winter, and spring on any of the Great Lakes, you’ll need more than that. Even if only wanting to surf in summer, keep in mind that it’s often a cool wind making the waves. The water may be warm, but the air maybe not so much. There is also a phenomenon called “upwelling” that often happens; when warmer surface water moves offshore and colder, deeper water “upwells” near shore. This typically occurs when the wind blows offshore – from land to sea – or on a certain swell direction, and can happen year-round. Wetsuit thickness is measured in millimeters, so that’s what the mm stands for. When you see a hooded winter suit that says 6/5/4mm, it typically means that there are 6mm in the chest and torso, 5mm in the arms and legs, and 4mm in the hood. This can vary a bit by manufacturer but it’s a pretty safe bet to keep in mind. So which wetsuit is right for you? Let us try to help by breaking one year down into four Great Lakes surfing seasons and using the two general parts of the Great Lakes region referenced above; north and south. We’ll do this because water (and air) temps can vary a lot across the region at any one time, especially Lake Superior vs. the rest of the Lakes. So keep in mind that this is a generalization, but a pretty trusty one. Okay, cool. What does this mean, then? 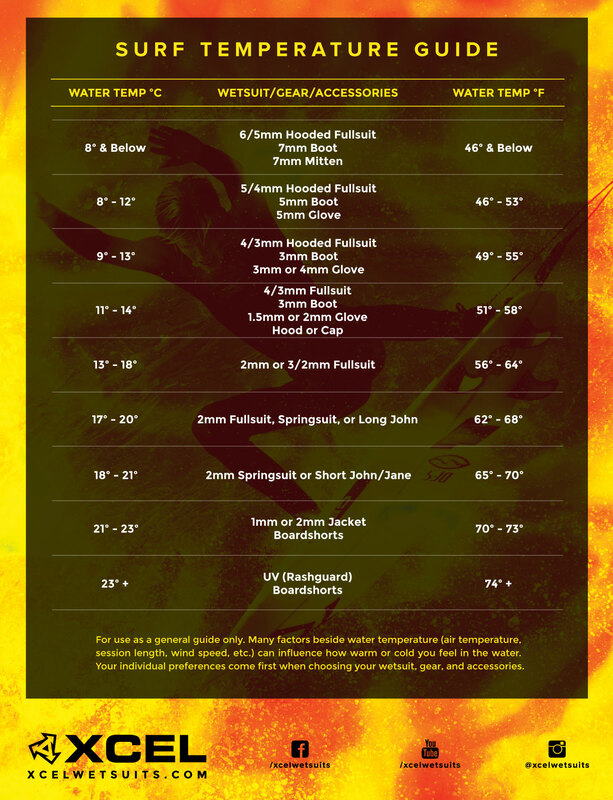 Here’s a general breakdown of which wetsuit types and thicknesses are typically appropriate for the different water temps. Obviously, the thicker suits pair better with the water on the colder side of the spectrum, and thinner suits for the warmer side of the spectrum. Keep in mind that this can vary depending on various factors like body type, tolerance for cold, etc., but this is a pretty good bet. Here’s a handy graphic from our friends at Xcel that can help break it down even further. We’ve been selling Xcel wetsuits since we first opened our doors in 2005…these guys know their stuff. As an example, say you aren’t too interested in surfing when it’s really cold but want to get out in the summer and early fall. One option might be to go with a 3/2mm or 4/3mm suit, then add boots, gloves, and a hood (or hooded polypro) for early and late season. For a lot of people, this type of setup could get you into October; and maybe even November. Last but not least, let’s talk about what we sell at TCSS and why we sell it. We’ve worked with and sold wetsuits from a variety of companies over the years, always looking for the best blend of quality and price. Being a small shop in a unique surfing market (the Great Lakes), we aim to have a highly curated selection of wetsuits and wetsuit accessories that do exactly that: find the right mix of high quality at fair and reasonable prices. They’re the wetsuits we wear, and we’re stoked to offer them to you. Our current stable of wetsuits are from Xcel, Quiksilver, and Vissla. The first two have been making and selling surfing wetsuits for decades, with Vissla being newer to the scene but producing incredible stuff at insane prices. Read on to see what we are currently stocking, and as always, reach out to us any time for some guidance on what might be best for you! Call us at 269-932-4575 or email us at info@thirdcoastsurfshop.com. You won’t find a nicer 4/3 for a better price, period. The FNLTE is – you guessed it – super light. It’s also warm and super comfortable. A killer wetsuit for less than $200. 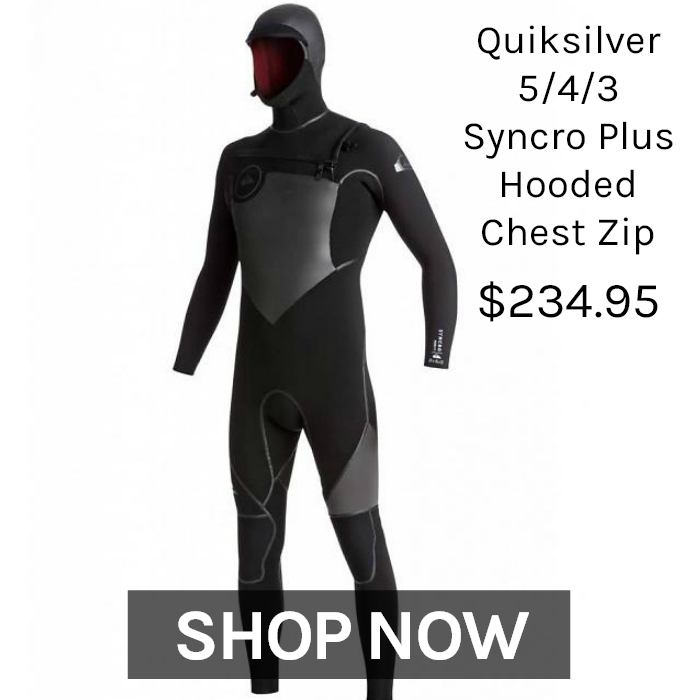 A quality cold water wetsuit for $235? Yes, please! 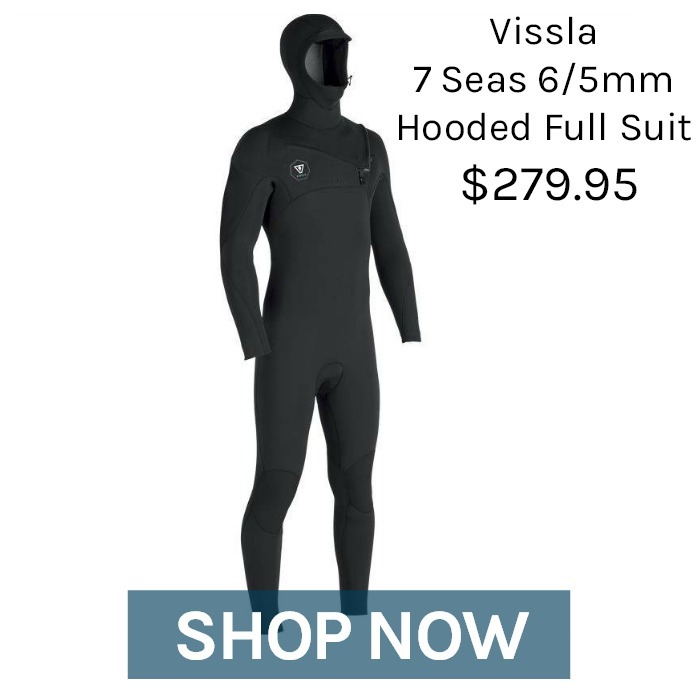 This has been our best-selling winter suit the past couple years for good reason; at this price, you’re getting a really nice wetsuit that – for many people – can get you through the cold season. If you’re more susceptible to getting cold and/or want to be assured you’re as warm as possible, check out the Xcel 6/5mm below (or the Quiksilver 6/5/4 Highline Hooded winter suit). 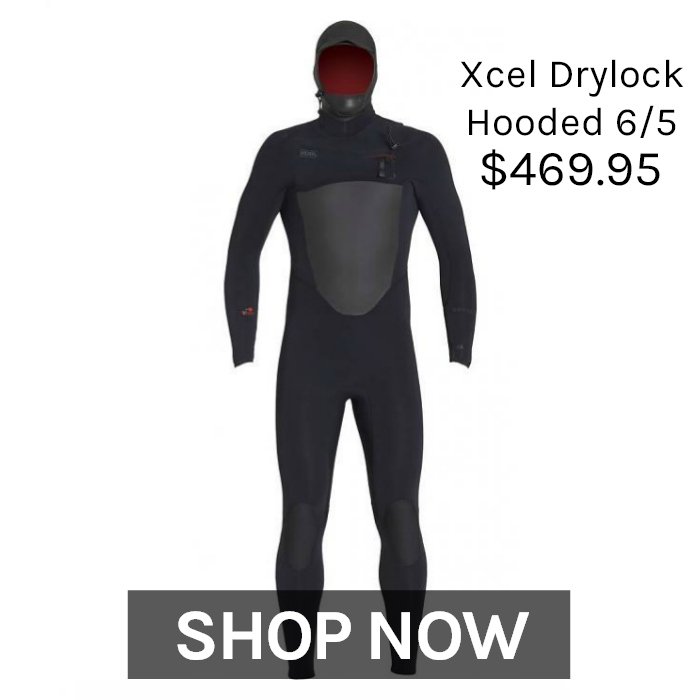 We’ve sold more Xcel 6/5 winter suits than any other since we opened our doors in 2005. 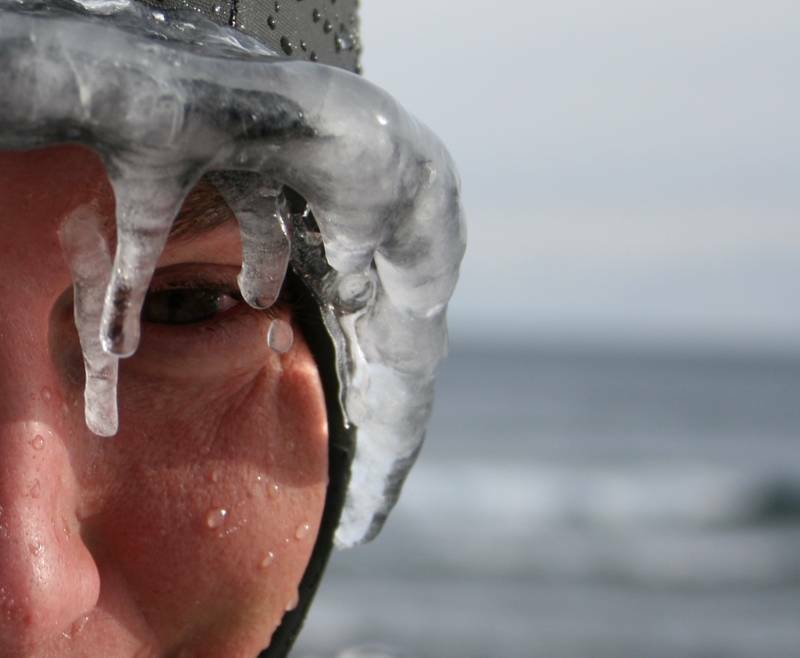 It’s no secret why: most people that have worn it (and other cold water suits) say it’s the warmest wetsuit they’ve ever worn. We have customers come back for this suit every time they need a new one; don’t even bother with anything else. Xcel upgraded it to Drylock status and continue to make the interior fiber better. Sure, it’s more expensive. But if you want the best, this is it. Last on this list but certainly not least, we are super stoked on the new 7 Seas 6/5mm hooded winter suit. 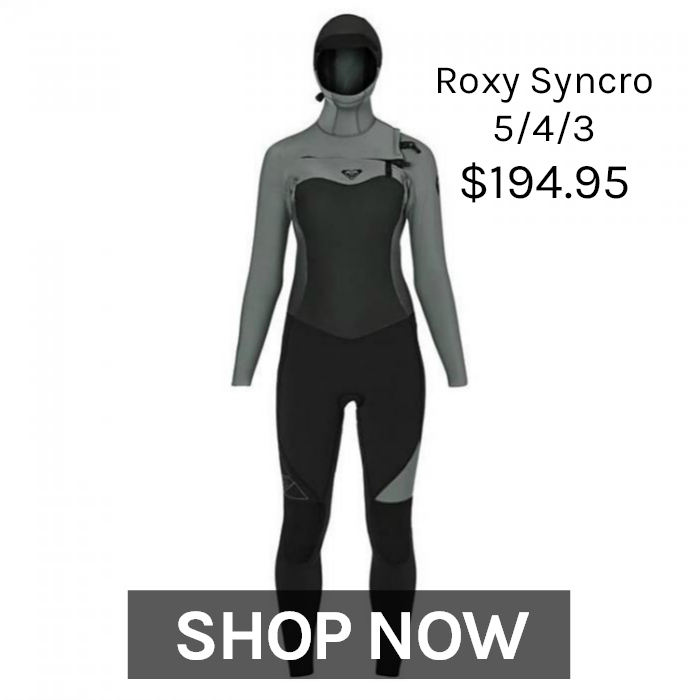 Our minds are blown here as this is an incredibly functional cold water wetsuit at an unbelievable price: $279. Seriously. We're also stocking their 7mm boots and mitts, also killer. 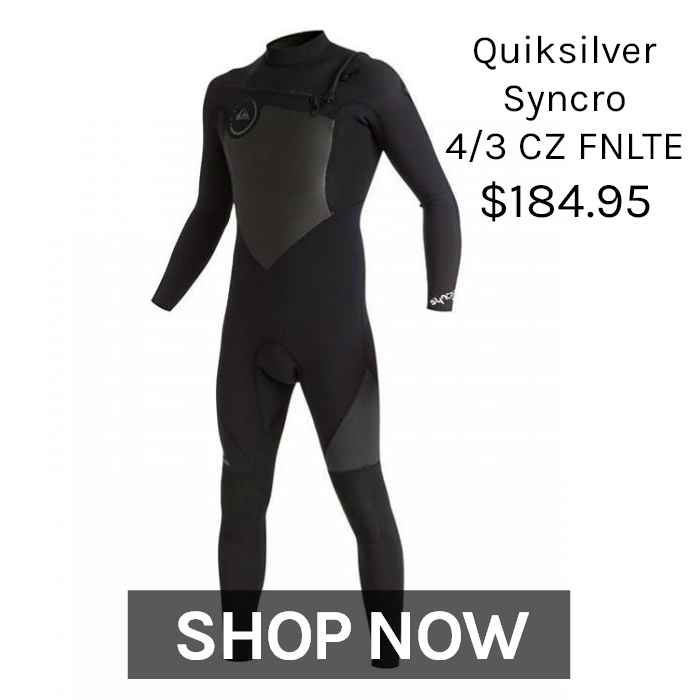 Buy all three and you;re into a full winter surfing wetsuit setup for $395! Take a deeper dive into the new Vissla 7 Seas 6/5mm in this blog post by TCSS Ryan Gerard. For ladies serious about getting out when it’s cold, we’re sorry to report that your options are more limited than the guys’ for two reasons: we have yet to find a 6/5mm wetsuit made specifically for women – it doesn’t exist (yet) – and there simply aren’t many thick, cold water wetsuit options out there. Having said that, we think we’ve found the best in the Roxy Syncro 5/4/3. At less than $200, this is a warm, light, stretchy hooded suit tailored specifically for women. By far the best-selling cold water mittens on the market, period. 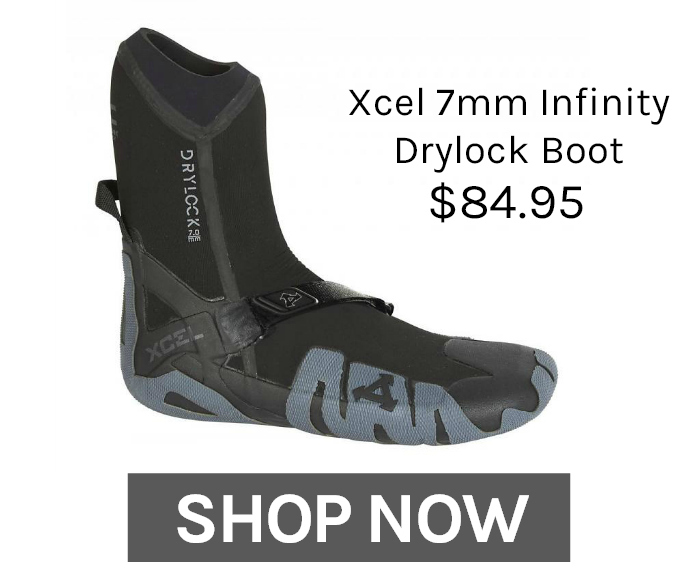 We introduced Xcel wetsuits to Great Lakes surfers in 2005 and the Drylock 7mm mitts and boots continue to outsell any other boot or mitt we’ve sold 5 to 1. It’s simple: these are the warmest, highest quality mitts on the market. Trust us, they’re worth the money. 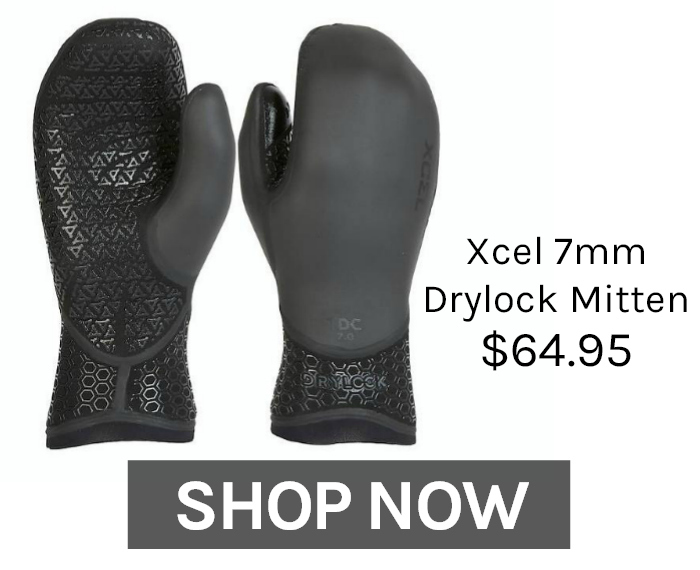 See the above description for the Xcel 7mm Drylock mitts and copy and paste it for the boots: these are the warmest, best-selling cold water booties in the world. Which is better, the 7mm Drylock or the 8mm Infinity? What’s the difference? The main difference is the Drylock cuff and Celliant Black lining in the 7mm, which are upgrades compared to the 8mm. However, the 8mm has the extra 1mm of neoprene – obvious extra warmth. In the end, it comes down to personal preference, but trust us when we say that you can’t go wrong with either. 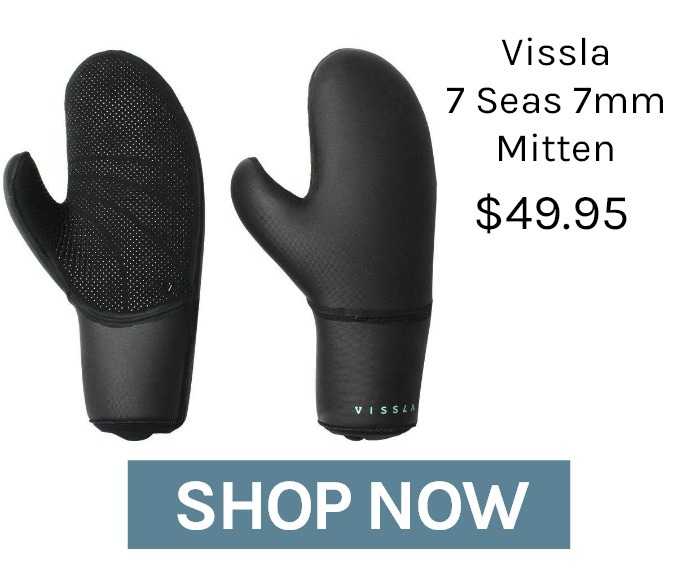 Looking for a serious cold water mitten and boot at the best price? Look no further. 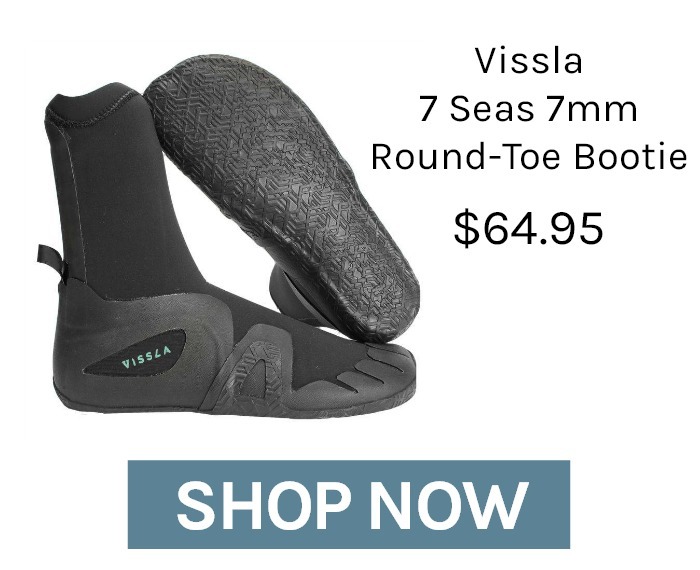 Vissla's 7 Seas series is all about functionality without the fluff you see in some other wetsuit accessories. These are seriously nice boots and mitts priced well below the comparable competition, and we're not just blowing smoke. These are the real deal.